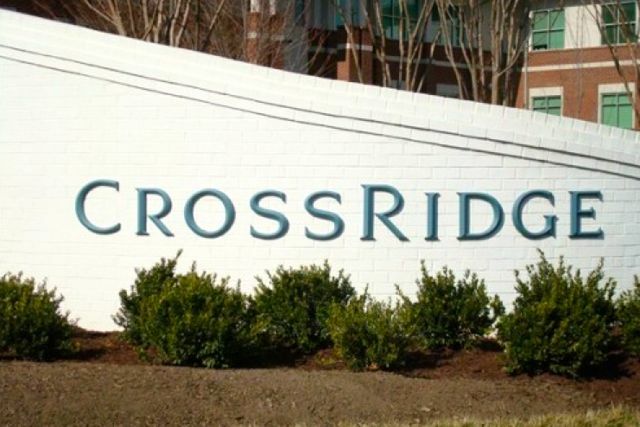 CrossRidge is a popular 55+ community for active adults in the Richmond area. The 746-residence community is made up of six individual neighborhoods, each one featuring a unique look and feel as well as an individual homeowners' association. It was built between 2001 and 2013 by Eagle Construction, which currently offers homes on a resale-only basis. Homebuyers will find single-family styles in addition to attached townhomes, duplexes and condos. Floor plans range from 1,760 to 2,360 square feet, most of which are single-level construction. Homes within CrossRidge include attached garages, two or more bathrooms and as many as four bedrooms. A number of different floor plans are available, some with lofts, great rooms, formal dining rooms and dining nooks. And residents have more time to pursue interests and hobbies thanks to a low-maintenance lifestyle: association fees cover exterior maintenance, snow removal, garbage collection and landscaping. Members of the community can take their pick from more than 100 events each month at the Pavilion Club, an 8,000 square-foot, beautifully appointed clubhouse on five acres. Social activities are a big part of the lifestyle here, and community staff along with several committees are on hand to help plan events and gatherings, as well as social club activities. The Pavilion also supports an active lifestyle with a fully equipped fitness center and an indoor heated pool and spa. For those who enjoy group workouts, the Pavilion hosts water aerobics, Pilates and yoga. Residents can also get together for a friendly game of tennis, cards or billiards, or take advantage of meeting rooms and an outdoor pavilion. Clubs, classes and activities cater to just about every interest, from computer courses and poetry readings to art fairs and continuing education. Community members regularly get together for wine tastings, game nights and bridge parties, as well. Shopping for daily necessities is easy at the nearby Village Shoppes, but homeowners will also find plenty of other shopping in the area, in addition to a world-class restaurant scene and plenty of historic and cultural sites in Richmond. The location is ideal for day trips up and down the East Coast. Residents are within easy reach of the Atlantic Shore, where they can take a scenic drive or enjoy a day at the beach. Virginia Beach, Norfolk and Chesapeake Bay are all within driving distance. For resort-style amenities and a low-maintenance lifestyle, all within reach of the Atlantic coast and in a historical setting, CrossRidge is an ideal active adult community.